Counterfeiters never fail to shock us. As per the joint study conducted by ASSOCHAM-RNCOS in 2015, about 60-70% of dietary supplements being sold across India are counterfeit, unregistered or unapproved. The awareness about the well being and health is increasing amongst the people. A lot of young people are interested in bodybuilding. But the Indian diet is mostly plant-based and is not loaded with fast acting proteins, so the majority of the people opt for dietary supplements to get the necessary nutrients for quick muscle building. Also the people, with higher spending power, generally have a busy lifestyle and are unable to eat a balanced nutritional diet regularly, so they turn to supplements to fulfill their nutritional needs. People have also become very conscious about their physical appearance; they also consume supplements for better hair, better skin, weight gain or loss and so on. These are some of the prime factors that nutritional supplements market in India is thriving and is expected to reach US$ 8.5 Billion by 2022. With the increasing demand of the supplements, the problem of counterfeiting in nutraceuticals is also rising. The packaging of the original and fake products is generally so identical that it is challenging for the buyers to differentiate between the both. Counterfeit dietary supplements are manufactured in unsanitary conditions and may not contain the active ingredients at all. They may also contain harmful chemicals and can severely affect the health of the consumers. Counterfeiting damages a supplement brand’s image badly and they also lose revenue. And on the other hand, the customers even lose trust in the brand. 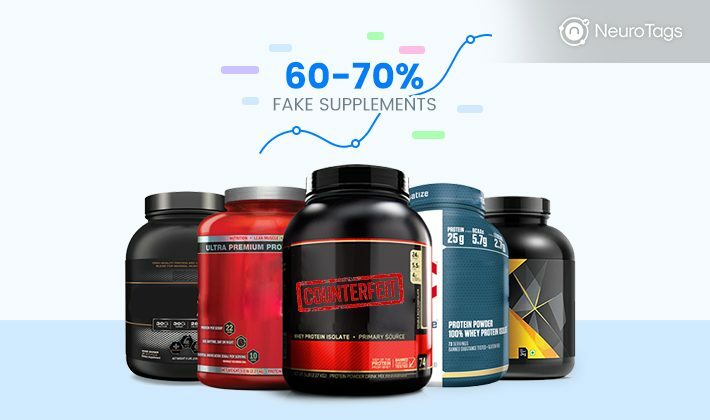 Dietary supplement manufacturers can protect their brands and save their customers from fake customers by deploying a robust Anti-Counterfeit solution. NeuroTags provides a foolproof Anti-Counterfeit solution with which brands can assure their customers that they have bought the brand’s genuine product. The Anti-Counterfeit solution by NeuroTags is very simple, economical and easy to deploy and protects Dietary Supplements brands against the counterfeiting. To solve this problem, NeuroTags offers algorithmically coupled crypto tags to be affixed on the product packaging. Each crypto tag consists of two parts – open tag and protected tag. Open and protected elements are algorithmically coupled, and the combination is unique for each product. These tags are backed by patent-pending technology & AI and can be scanned using any smartphone. The open part of the crypto tag can be scanned by the prospective buyer to check the product authenticity with a reasonable amount of certainty. A buyer can be 100% sure of the product genuineness after scanning the protected tag. This part of the tag is either hidden by the scratchable layer or is kept inside the sealed packaging. The buyers have access to the protected tag only after purchasing the product. All the open and protected tag scans are monitored and guarded by anomaly detection algorithm and AI on NeuroTags server. If a counterfeiter tries to make the replicas the tags and use them on fake products, the algorithm catches anomalies in tag scans, and the products with copied tags get invalidated. In case a product’s tag scan is detected to be spurious, the user is led to a screen where the information about helpline numbers and ways to report the counterfeit is displayed. NeuroTags also offers the Loyalty program and referral program features on the same tags. These features help in customer retention as well as bringing in new customers.